You live in a home where all the belongings and stuff has a place it’s meant to go. The stuff that is there in your home is stuff you like or stuff you need, so things are being used regularly and maintained properly. If something is broken, it gets fixed. And it’s not a drudgery, because you’re not doing this out of guilt or obligation to ‘the stuff’. These are things you’ve chosen to have in your life. Even after a party or a rough few days of illness and it looks like a tornado has struck, it doesn’t take you long to put everything back into place. When everything belongs somewhere, the mess always looks worse than it really is. Your home feels clean to anyone who enters, even though you notice it isn’t perfectly clean. You don’t mind. You regularly dust, vacuum, and clean your kitchen and bathrooms. A dirty dish in the sink or some grass on the floor (brought in after your kids played outside) doesn’t send you into a panic because you have a routine for keeping things clean enough for a happy life, and you’ll get to that dish and that grass. When a household task comes to mind that needs to be done, you make a plan and do it. You’re in the habit of getting these things done. You have confidence in your follow-through, so you don’t have to be anxious about “if I forget to do this, disaster will strike”. You’ve written it down and it is part of your routine to check your plan. You don’t have fear, or anxiety, you just get to steadily go through the motions so that your mind is free to think about family, friends, spirituality, hobbies, your life’s work, service, what’s for dinner, and all the other moving parts of life. Basically, imagine a life where you get to live in a clean home where things are running smoothly, but they aren’t running smoothly because you are obsessed with them. Instead of feeling a whole bunch of stress associated with keeping your house clean, you feel relief from having a plan. What do you think? Does that life sound pretty good? THAT is The Art and Beauty of Maintenance Living. THAT is the whole point of what we’re doing on the blog. We started with the Declutter Challenge, and now we’re doing the Spring Cleaning Challenge that is not only helping you get some deep cleaning done, but very importantly, jump-starting some important maintenance habits. Right now, how do you remember to un-hook your hoses before it freezes so that water that doesn’t drain properly doesn’t burst a pipe and flood your house? Oh, do I wish I was making this up scenario as a scare tactic! But nope, I was young and newly married and new to home-ownership and the flood in my house shocked me. I guess this is a little different than remembering to do it, because I didn’t even know I was supposed to unhook the hoses before winter in the first place. That was the day the Household Management Checklist (aka HH List) was born and I started to track when stuff needed to happen. But really, how do you remember to do all of this kind of stuff? Do you have it swirling in your brain, stressing you out or just going un-done? Do you have a list somewhere of your own (good job!)? Without a good system, so much of it either falls through the cracks and never gets done until you’re dealing with costly repairs INSTEAD OF proactive maintenance, or you remember in some kind of time crunch and you constantly feel like you’re playing catch-up! Dirt and grime accumulate in our homes throughout the year, and whether we can truly see the buildup, we can definitely feel the buildup. You deserve to feel good in your home throughout the year and by spreading out some of the deep cleaning tasks, you don’t allow the grime buildup to ever get really bad. Plus, the psychological benefits to maintaining instead of just cleaning in bursts are just as important as the practical reasons for a good Maintenance Plan. The hardest part of any project is usually starting it. If the project of maintaining your home is on-going, you are setting yourself up to win the fight against procrastinating starting again and again, because you only start once. We don’t want any mess in your home to ever build-up to an overwhelming stage ever again. That overwhelmed state can be very paralyzing to progress. Taking care of important things in a timely manner is empowering, and if you aren’t in that groove yet, trust me when I tell you that there really is a groove to it. If you keep at it, you’ll find that it becomes easier to remember and take are of things as you work to regularly take care of things. There are chores and tasks that need to be happening throughout the year, and if you are in touch with your plan using the HH List, you are going to stay on top of these things. Using the HH List to track Annual chores/tasks. 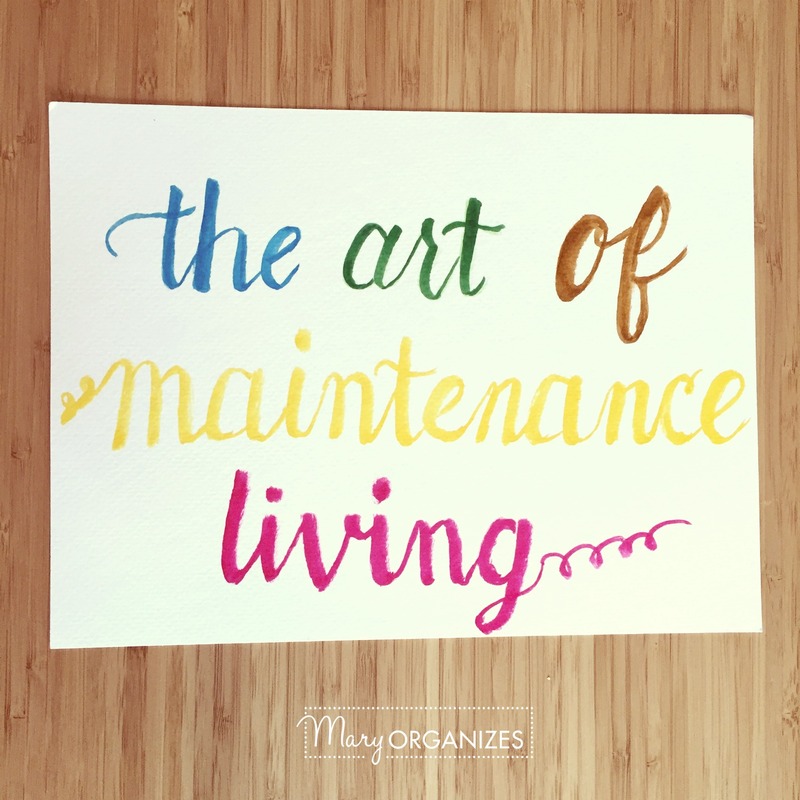 The Art of Maintenance Living is learning to live in the freedom of having a Clean Enough home all the time. Thank you it sounds like a dream come true. I took a class on calligraphy at a conference I went to recently – it was so much fun!